The lion with Durga on it is the symbol of the Divine Consciousness acting through a divinised physical-vital and vital-emotional f orce. The lion is the attribute of the Goddess Durga, the conquering and protecting aspect of the Universal Mother. One must not be distressed or depressed by perceiving the weaknesses inherent in human nature and the difficulty of getting them out. The difficulty is natural, for they have been there for thousands of lives and are the very nature of man's vital and mental ignorance. It is not surprising that they should have a power to stick and take time to disappear. But there is a true being and a true consciousness that is there in us hidden by the surface formations of nature and which can shake them off once it emerges. 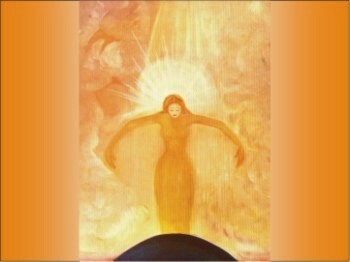 By taking the right attitude of selfless devotion within and persisting in it in spite of the surface nature's troublesome self-repetitions one enables this inner being and consciousness to emerge and with the Mother's Force working in it deliver the being from all return of the movements of the old nature.